Young people are an energetic portion of a society. They can get involved in political activism. They can also contribute to the fight against corruption, insecurity, and factors such as nepotism to establish a better government. How difficult was it for you to become an active member of society? When you enter into social situations, you gradually find out where you actually stand. When I see social problems others face, I start thinking of solutions and bringing change. When I worked in various fields and saw specific problems facing women there, I got motivated and became more active. Have you ever faced any serious problems while engaging in social and political activism? Undoubtedly, those who are involved in social and political activism become victims—the victims of unfavorable culture. There are also political and security obstacles. However, when one commits to moving forward, then s/he must expect hindrances and must overcome them. You are a member of the management board and head of the women’s committee of the Khat-i Naw Organization. What made you join this organization? No one can reach his/her goals alone. A long journey begins with a single step. When I worked with this organization and became familiar with its activities, I realized that collective efforts have positive impacts. Do you think young people have been able to properly utilize the opportunities that have been available to them over the past few years? It must be said that these opportunities have been accompanied by a number of difficulties as we dealt with a society in which everything—technology is one example—was new. Some young people made the utmost use of the opportunities available, while others could not. Meanwhile, awareness among young people went up. They took part in social, political, economic, and educational activities. Now they play an important role in media and civil society organizations. At the same time, the challenges facing them cannot be ignored. There are obstacles such as outdated customs and traditions and, above all, security problems. The women have no social protection. Also, the structural culture that we have inherited makes up another part of these challenges. Overcoming such challenges takes time. What do you think about young people’s political participation? In my opinion, young politicians have done quite well so far. Their activities largely depend on the opportunities available to them; there are people who, despite having done their master’s degree and doctorate, are jobless, and no one seems to be caring about them. There is nepotism and favoritism in government and other offices. Meanwhile, young people have seen significant social development, and people do value them. They played an active role in the recent elections in the country. Young parliamentarians play important roles in approving laws and regulations. 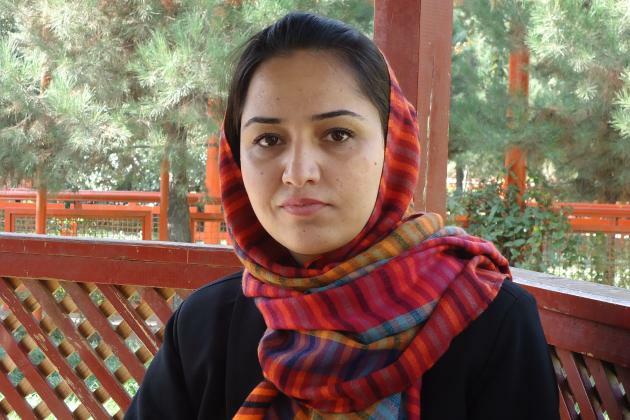 If young Afghans are given opportunities, I am sure the country will change for the better. With the establishment of the new government in the country, how can young people achieve more? As a young woman, what differences do you see between today and thirteen years ago? There is significant difference. Women have more political, social, and cultural capital. Above all, girls are getting educations. During the Taliban regime, women were not even allowed to come out of their houses without a man accompanying them. Today women can travel to other countries. We can see women in all governmental and non-governmental offices. If the new government can ensure that social justice and civil rights are respected, there is no doubt that better opportunities will be available to women. What other activities do you pursue, besides the Khat-i Naw Organization? My activitism began with educating. I have taught school subjects, English, and computer skills. Currently, I am working on a women’s project with the US Embassy. In general, how favorable do you think the political climate and security situation are for fostering the equal and active participation of women? It cannot be said now that the rights of men and women are equal. But at the same time, some work has been done for women. Some have dared to make real uses of their rights by doing things like getting education and engaging in social and political activities. But that is not enough. There is a need for more efforts to increase women’s participation. I wish we could have a peaceful and prosperous country where social justice is executed and where no woman is deprived of the blessing of getting an education. Why leaving Afghanistan might be the preferred choice for the young and restless. The main victims in the fight to reach peace and security are young people. Nonetheless, in government decision making, the role of young politicians is negligible; this shows what the government’s motivations actually are. Since the fall of the Taliban, Youth have emerged as an important political and economic force in Afghanistan. They are one of the most important demographic groups, with nearly two-third of the population being under the age of 25 years.